When congestion plagues you, the simple act of breathing can be challenging. Whatever the cause, allergies, cold or flu, dealing with it can leave you feeling tired and dreary. The nose has a network of blood vessels with valves that open and close. When it is stimulated by irritants, the nervous system is also stimulated, which causes the valves to open, resulting in more blood entering the nose. This can cause swelling in the nasal passage, which makes it difficult to breathe. Although there are many over the counter medications such as decongestants, many simple home remedies, and herbs can offer natural relief. 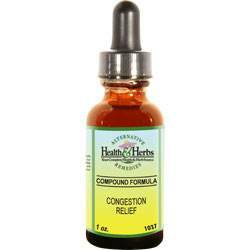 The herbs in this formula just may help you to start breathing easier. Bayberry root is often recommended for sinus congestion. The natural constituent in the root and bark known as myricitrin is believed to work as an antibiotic that helps to fight infections that trigger overall production of mucus. When used for its astringent properties it is useful for bringing down the inflammation of the membrane and dries mucus secretion. Blood Root tinctures have strong expectorant qualities, which means it promotes the passage of phlegm through the bronchial tract. This makes it useful for treating respiratory ailments such as bronchitis and asthma. It also has anti-spasmodic properties, which reduces tension and spasms in the bronchial tubes. This action is beneficial in cases of catarrh and severe coughs. Bloodroot also is found in some cough syrups and is full of antibacterial properties, which is useful as a sore throat remedy. Bloodroot has been proven to be helpful in cases of pneumonia, emphysema, laryngitis, croup, common cold and sinus infections. Mullein Leaf is rich in vitamins and minerals. The herb, with its astringent, antispasmodic, demulcent, anti-inflammatory properties, acts as an expectorant and helps to drain out mucus. Mullein is also believed to help reduce swelling, in joints and glands. It is commonly used for a number of respiratory disorders, such as asthma, hacking coughs, sinus congestion, bronchitis and hay fever. This herb has also been used for ear infections, to reduce pain and inflammation. Garlic bulb has been utilized for medicinal purposes for thousands of year. Due to the active compounds, it is commonly used for chest congestion and found to be quite effective for treating common cold symptoms. Garlic bulb tincture contains allicin, which is derived from cysteine. This amino acid and sulfur-containing compound that is helpful in improving immune system function, and relief of chest congestion. Lobelia leaf dilates the bronchial and relaxes muscle spasms in the lungs. This may make it a valuable remedy for asthma, whooping cough, spastic cough, and bronchitis. It has been used by herbalists with Garlic Bulb and Cayenne, to ease congestion in the lungs and to help expel mucus and fluid in the lungs. Lobelia tincture may also help ease the tension when coughing has become unbearable. Another benefit of Lobelia is that it promotes lymphatic drainage, and combined with Mullein leaf, it may promote lymph drainage, reduce swelling in the lymph nodes, ease congestion, help ease mumps, tonsillitis and ease congestion. Cayenne Pepper has been an excellent home remedy for breaking up and flushing out mucus. Additionally, it helps to stimulate the circulatory system and loosens the mucus in the lungs associated with infections. Research centered around Cayenne pepper tinctures show that, when taken orally, it may work as a catalyst for other herbs that also help to clear chest congestion. Capsicum has a great warming effect, and although it is neither a mucilaginous or demulcent herb, it has been shown to work wonderfully well for easing sinus and lung conditions. Ingredients: Bayberry Bark, Blood Root, Mullein Leaf, Garlic Root, Lobelia Leaf, Cayenne Pepper, Structured Water, 20% Alcohol. Non-Alcohol: Bayberry Bark, Blood Root, Mullein Leaf, Garlic Root, Lobelia Leaf, Cayenne Pepper, Structured Water and Vegetable Glycerin. Instructions: Use 6-30 drops in mouth, juice or water. May be taken 3 times daily. Shake well. Store in cool dark place.